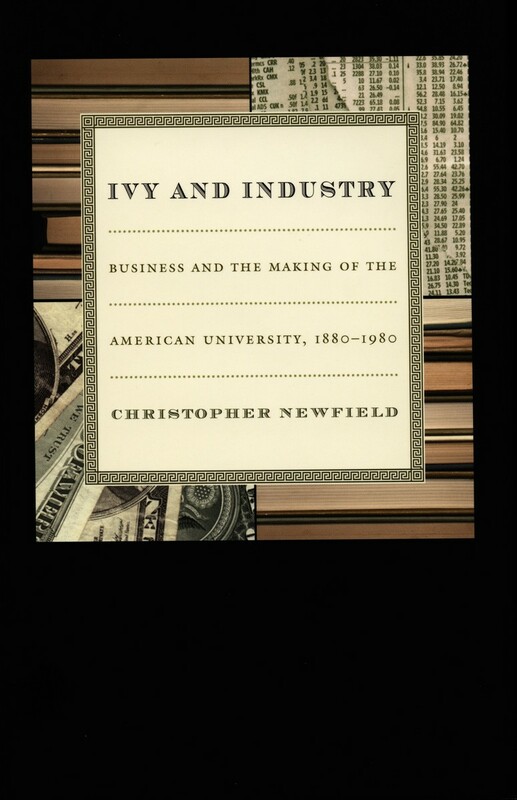 Christopher Newfield is professor of literature and American Studies at the University of California at Santa Barbara. He brings an interdisciplinary background to the analysis of a range of topics in American Studies, innovation theory, and “critical university studies,” a field which he helped to found. Chris’ books include Mapping Multiculturalism (edited with Avery Gordon), The Emerson Effect: Individualism and Submission in America (Chicago, 1996), Ivy and Industry: Business and the Making of the American University, 1880-1980 (Duke, 2003), and Unmaking the Public University: The Forty Year Assault on the Middle Class (Harvard, 2008). His writing covers American political psychology, race relations, the future of solar energy, and the power of humanities-based investigation. 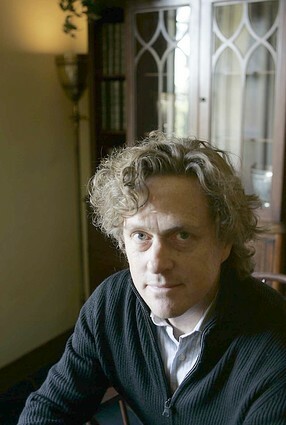 He teaches courses on Detective Fiction, Global California, Innovation Studies, Critical Theory, the Future of Higher Education, and English Majoring After College among others. 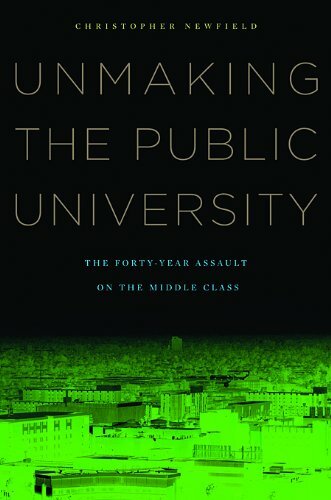 He blogs on higher education funding and policy at Remaking the University, the Huffington Post, and the Chronicle of Higher Education, and is completing a book called Lowered Education: What to Do About Our Downsized Future. Closing the Educational Divide: What is the Role of Online Higher Education? "Current Budget Trends and The Future of the University of California"
Office of Research, UC Santa Barbara. Yes to the New Education, But What Kind? What Is Literary Knowledge of Economy? Higher Education and "Identity Politics"
Aftermath of the MOOC Wars: Can Commercial Vendors Support Creative Higher Education? Are UK Universities Being Cast Academically Adrift? The End of the American Funding Model: What Comes Next? La fin du modèle de financement américain : comment le remplacer? Can Americian Studies Do Economics? * Full publication available with subscription or payment. Have We Wrecked Public Universities? What Will it Take to Make UC’s Budget More Transparent? Are UC’s Tuition Hikes a Good Idea? Anything New in the UC Regents’ Retreat? Europe’s Economies: The Crisis Continues? 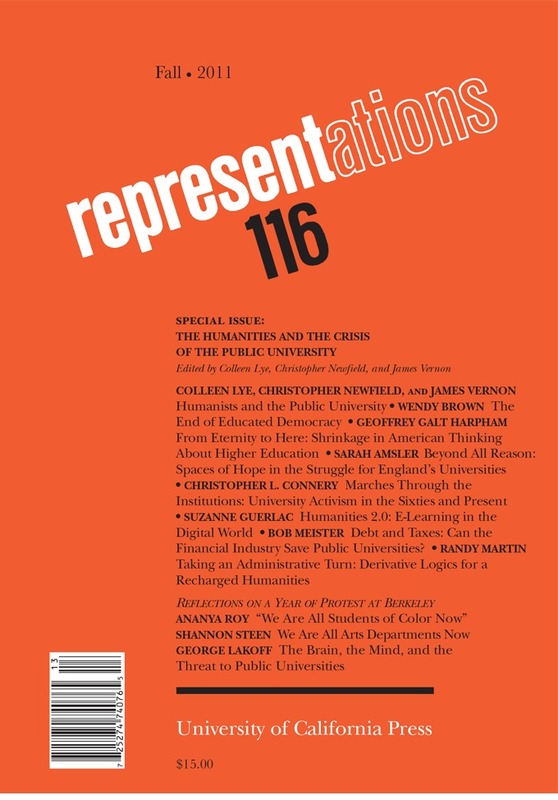 The Budget Cuts: How are they Affecting Undergraduate Education? The US and Europe: Policy Divergence on the Crisis? ADE-ADFL Seminar, University of Minnesota-Twin Cities. Institute of Advanced Study, Princeton. Critical University Studies as Media Studies? Society for Cinema & Media Studies, Chicago. Danish Royal Academy Meeting with Secretary of Research and Higher Education, Copenhagen. Centre for Teaching Innovation, University of Westminster, London. University of Hawaii Arts and Sciences Senate Executive Committee, University of Hawaii, Manoa. Have We Wrecked Public Universities? If So, How Do We Fix Them? Dai Ho Chun Distinguished Chair Lecture, University of Hawaii, Manoa. Center for Cultural Studies, UC Santa Cruz. American Studies Association Convention, Denver, CO.
Association for the Study of Higher Education, Columbus, OH. Chicago Humanities Festival, Chicago, IL. Why Don’t Universities Support Racial Equality? James E. McLeod Lecture on Higher Education, Washington University in St. Louis. International Science and Technology Indicators Conference, Ingenio (CSIC-UPV), Valencia, Spain. Utopian Universities Colloquium, University of York, UK. Knowledge Futures Symposium, University of Cape Town, South Africa. Knowledge Futures Symposium, Wits Institute for Social and Economic Research (WISER), Johannesburg, South Africa. Limits of the Numerical Workshop, University of Cambridge. University of Bonn Consulate Series on the 2016 US Election. Cultural Studies Association, Villanova University, Philadelphia, Pennsylvania. Western Political Science Association, San Diego, California. American University of Beirut, Lebanon. Simpson Center for the Humanities, University of Washington-Seattle,. Where Are the Humanities in Research Funding? UNIKE workshop, University of Oslo, Norway. Social Science Center, Lincoln, England. Metrics Mania in Higher Education: What Should Faculty Do? What Has Happened to Solar Innovation? Democratizing Governance Conference, UC Santa Barbara. What Was Faculty Governance? How Can it Be Rebuilt? Learning with MOOCs II, Teachers College, Columbia University. Cogut Center for the Humanities, Brown University. Education Faculty, University of Porto, Portugal. Legislative Committee on Industry, Legislature for Rheinland-Wesphalia, Düsseldorf, Germany. Knowledge Landscapes of North America conference, University of Bonn. Neoliberalism + Biopolitics Conference, UC Berkeley. Energy Challenges in the Developing World workshop, Interdisciplinary Humanities Center, UC Santa Barbara. Universities in the Knowledge Economy University of Auckland, New Zealand. Critical University Studies Panel, Modern Languages Association Conference, Vancouver. University of Toronto Faculty Association. The Operation of the Machine: UC Then and Now, UC Berkeley. The New Normal: What Does it Mean to Work at UC Today? School for Criticism and Theory, Cornell University. Governing Academic Life Conference, London School of Economics. UCLA Dean’s Forum on the Humanities. What are the Humanities For - in the 21st Century? Obermann Center for Advanced Studies, University of Iowa. Center for 21st Century Studies, University of Wisconsin-Milwaukee. University of Wisconsin-Madison School of Education. Glasscock Center, Texas A&M University. 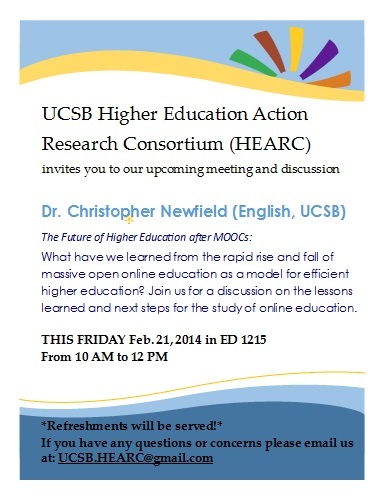 UCSB Higher Education Action Research Consortium. Interdisciplinary Humanities Center, UC Santa Barbara. 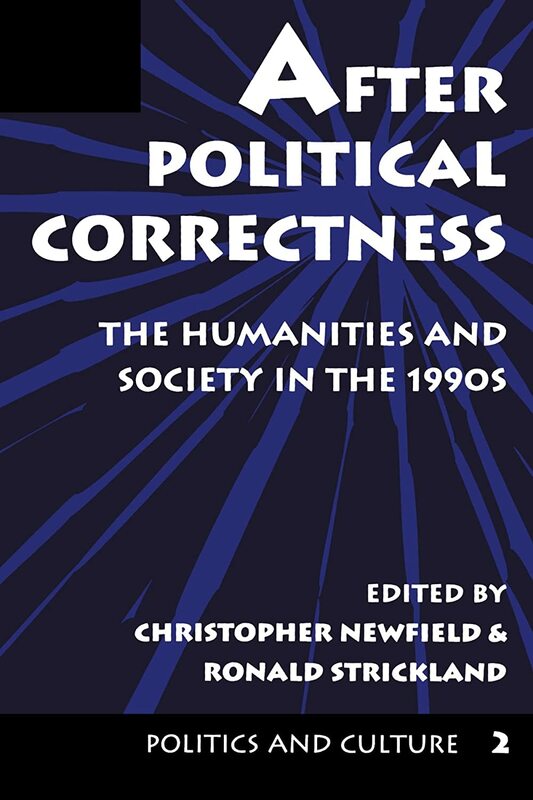 What's Wrong and What's Right with the Standard Defences for the Humanities? TORCH Center - "Humanities and the Public Good," University of Oxford. MLA Subconference, Columbia College Chicago. Privatisation and Crisis in Higher Education, SOAS, London. 10th Annual Historical Materialism Conference: "Making the World Working Class," SOAS, London. Universities in the Knowledge Economy, Copenhagen, Denmark. MOOCs as an instrument of global democracy? EPOKE Seminar Lecture, Copenhagen, Denmark. How Will MOOCs Affect US Universities’ International Strategy? Consortium of Humanities Centers and Institutes Annual Meeting. Grinnell College Center for Humanities. College Arts and Humanities Institute, Indiana University. Arts Center Inaugural, University of Umeå, Sweden. Does Innovation Theory Need the Humanities? HUMLab, University of Umeå, Sweden. Does Innovation Theory Need Cultural Study? Does Cultural Study Need Innovation Theory? JFK Institute, Free University of Berlin. Center for Cultural Analysis, Rutgers University. American Anthropological Association, Montréal, Québec. 6th International Conference In Interpretive Policy Analysis, University of Cardiff, UK. Centre for Research in the Arts, Social Sciences and Humanities, Cambridge University. Open Source Nano for the ‘Developing’ World? MLA Counterconference, Loyola Law School, Los Angeles. American Studies Association Convention Presidental Plenary, San Antonio. American Studies Association of Turkey, Alanya. Is Nanotechnology Changing Technology Transfer? Can the US National Innovation System Work for Low- and Medium-Income Countries? Quelques mauvaises idées budgétaires américaines qui attendent leur application universitaire en Europe: pourquoi les éviter? Innovation Troubles: Could a Better Public Narrative Help Solar Energy? Center for Nanotechnology in Society, UC Santa Barbara. Robert Eliot Memorial Lecture, Literature Department, UC San Diego. The End of the American University: What Coes Next? New Universities Keynote, University of Washington-Boethell. The End of the American University: What Comes Next? American Studies Program, UC Davis. Department Chairs’ First Annual John Gemello Academic Leadership Symposium, San Francisco State University. Vampire Slayers Project, San Francisco State University. Center for Social Theory and Comparative History, UC Los Angeles. Is the West Facing an Innovation Crisis? States of Innovation (Université de Lyon 3 & ENS-Lyon). What’s Left of Obama’s Presidency? Academic Crisis: What Should Graduate Students Do? Modern Languages Association (in absentia). FOREDUC, University of Paris – X, Nanterre. Institute Méditerranéen de Recherches Avancées, Marseille. Meeting on the Perils and Opportunities of the Internationalisation of Higher Education, Université de Lausanne. Conference on the Global University, La Sapienza, Roma. CNRS Meeting on Nanotechnology and Global Development, Ivry-sur-Seine. Presentation to National Science Foundation site team, Center for Nanotechnology and Society, UC Santa Barbara. Collaboration at the Nanoscale: Does it Accelerate Innovation? University of Paris 10 – Nanterre. Modern Languages Association, San Francicso. Institut Méditerranéen de Recherches Avancées, Marseille, France. Amerian Studies Association Convention, Albequerque, NM. Center for Critical Ethnography, University of California at Irvine. “Université de l’Automne” de Sauvons la Recherche, Conseil régional de Midi-Pyrénées, Toulouse. Conference on Tracking the Hidden Developmental State, Institute for International Studies, UC Berkeley. NSF Site Visit, Center for Nanotechnology and Society, UC Santa Barbara. Philosophy Department, University of North Texas. Humanities Center, University of California, Irvine. Meeting of the Council of Chancellors, the University of California. Université de Paris X - Nanterre. Modern Languages Association (via panel colleague). Centre d’Etudes Politiques, Université de Paris VIII - Saint-Denis. American Studies Association (via panel colleague). National Advisory Board Review Center for Nanotechnology and Society, UC Santa Barbara. Center for Nanotechnology and Society, UC Santa Barbara. American Studies Association, Oakland, CA. Institut de l’études européens, Université de Paris - VIII. Atlanta Science and Technology Conference, Georgia Institute of Technology. Tomorrow’s People Conference, Said Business School, University of Oxford. What is American Business Culture? Middle Eastern Studies Center, New York University. The University in an Age of Commercial Research: Where will the Bologna Process Take Europe’s Universities? Instituts für Nordamerikastudien, Albert-Ludwig Universität, Freiburg, Berlin, Germany. Why Do the Culture Wars Continue, and What Do They Mean? des John F. Kennedy-Instituts für Nordamerikastudien der Freien Universität Berlin, Germany. Colloque Cultures impériales; perspectives transatlantiques sur les empires, Université de Paris X-Nanterre. American Studies Association Convention, Washington, DC. What is Cultural Studies Today? North Carolina A&T, Greensboro, NC. Law and Society Association National Convention, Las Vegas , NV. Cloning Cultures Conference, UC Humanities Research Institute, Irvine, CA. American Association of Colleges and Universities National Convention, San Francisco, CA. American Studies Association Convention, Atlanta, GA..
Public Feelings Panel, American Studies Association Convention, Atlanta, GA.
American Studies Association, Hartford, Conn.
Modern Languages Association, New York. UC Office of the President, Patent Coordinator’s Meeting, Oakland. Does Diversity Have a Theory? Theories of American Culture, Free University Berlin. Modern Languages Association, New Orleans. American Studies Association, Washington, DC. Social Sciences Research Council conference on the New Economy, Emory University. American Studies Association, Detroit, MI. California Studies Association, San Diego. Business Culture conference keynote address, San Jose State University. University of Michigan Business School. 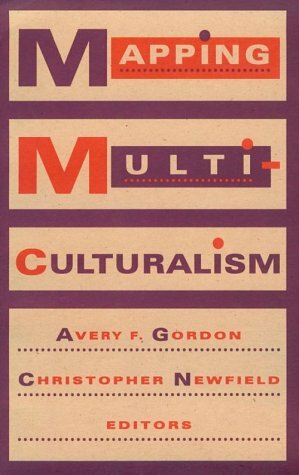 Is There a ‘Consensus’ Multiculturalism? Critical Resistance: Beyond the Prison-Industrial Complex, UC Berkeley. American Studies Association, Washington DC. Public Intellectuals and the Future of Graduate Education, University of Chicago. Lecture Series on “Whiteness,” University of Kentucky. Modern Languages Association Convention, Washington, DC. The Greenfield Code, KCTV, Santa Barbara. Keynote address, American Studies Association of Turkey Seminar, Izmir. American Studies Association of Turkey Seminar, Izmir. UC Santa Barbara Community Relations Symposium. USIS lecture, UC Santa Barbara. USIA lecture, UC Santa Barbara. Two day symposium leader, San Diego State University. German-American Symposium, UC Humanities Research Institute. Modern Languages Association Convention, San Diego. American Studies Association Convention, Nashville. Conference on "Knowledges: Production, Distribution, Revision," University of Minnesota. Institute on Culture, Carnegie Mellon University. Presidential Inaugural, Reed College, Portland, OR. Sociology Colloquium, UC Santa Barbara. Modern Language Association Convention, New York. Capital Read Derrida, Response to Judith Butler's "Bodies that Matter,"
USC Center for the Study of Women and Men. In a series Six Views of Political Correctness, Channel 21, Santa Barbara, CA. Modern Languages Association Convention, San Francisco. Society for the Study of Social Problems, Cincinnati OH. Institute on Culture, University of Oregon. Modern Languages Association Annual Convention, Chicago. American Studies Association Convention, New Orleans, LA. Western Humanities Conference, Berkeley, CA. Modern Language Association Convention, Washington DC. American Studies Association Convention, Washington DC. Meeting of the International Association for Philosophy and Literature, Emory University, Atlanta, GA.
Northeast Modern Language Association, Wilmington DE. Houston Museum of Fine Arts. Texas American Studies Association, Wichita Falls, Texas. South Central Modern Languages Association convention. Cultural Studies Symposium, Rice University. Northeastern Modern Language Association convention. Fin de Siècle Readings: The Twentieth Century in Our Time, Cornell University.